NEIU student Melanny Buitron speaks to fellow panelists about her journey being a DACAmented student. 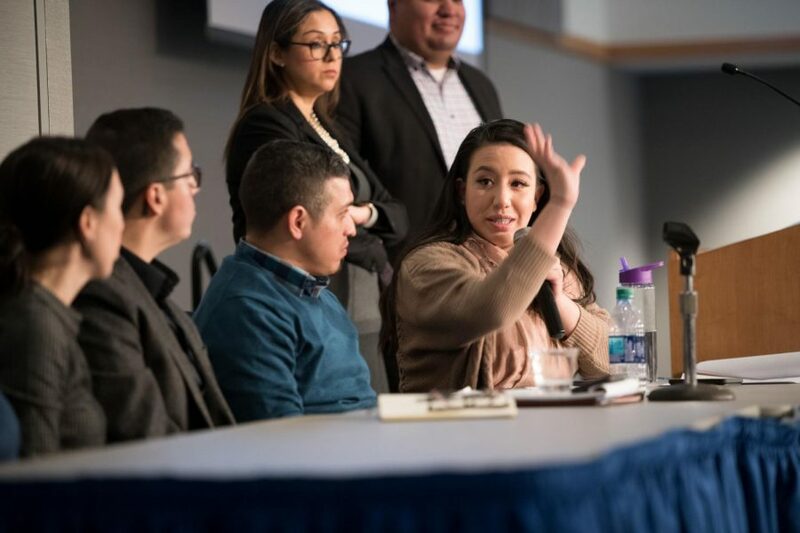 The first town hall meeting offered a public, open space for five panelists to talk about the current immigration upheaval to Deferred Action for Childhood Arrivals (DACA) program on Nov. 20. The meeting was live-streamed on SPR. NEIU student Melanny Buitron was one of the panelists. Buitron migrated to the U.S. at the age of one. Buitron said that positive reinforcement for undocumented students allows them to “come out” and tell people about their situation. Buitron stressed the importance of U.S. citizens voting. According to the Center for Immigration Studies, 44.5 million immigrants in the U.S. are not eligible to vote. Buitron also spoke on the lack of acknowledgment of mental health services for undocumented students. The other four panelists were Tanya Cabrera, associate director for equity and inclusion at the University of Illinois at Chicago; Maureen Fitzpatrick, associate vice chancellor of adult education at City Colleges of Chicago; Dr. Miguel Angel Saucedo, director of strategic partnerships and special populations for Chicago Public Schools; and Joseph Saucedo, assistant director of student diversity and multicultural affairs at Loyola University Chicago. Dr. Saucedo said that within the 25 participants who were awarded the Illinois Dream Fund Scholarship, over 90 percent of them were working part-time jobs. He asked the panelists what they were doing to provide additional resources for access to funding. Joseph Saucedo spoke on the Magis Scholarship Fund: a scholarship created for undocumented students by the Student Government of Loyola Chicago (SGLC) and the Latin American Student Organization (LASO) at Loyola. Students in both organizations collaborated to allocate funds by fundraising and by adding an additional fee of $2.50 every semester to the Loyola`s Student Development fee. SGLC and LASO raised $100,000 in 2015 and received an additional $50,000 from Don Graham, chairman and CEO of Graham Holdings Company and founder of TheDream.US. Saucedo said without the support of student social justice advocates, undocumented students would not have had enough financial assistance at the university. When Buitron attended the Wilbur Wright College orientation, she was encouraged to visit Wright`s Wellness Center. NEIU’s Student Counseling Services is free for students and is located at B-119. Their office hours are Monday through Thursday from 9 a.m. to 5 p.m. and Friday from 9 a.m. to 4 p.m. Contact Director of Undocumented Student Resources Luvia Moreno at [email protected] for more information on available scholarships for undocumented students. Comments are subject to review for slurs and offensive language. Comments will not be edited except to modify profanity.